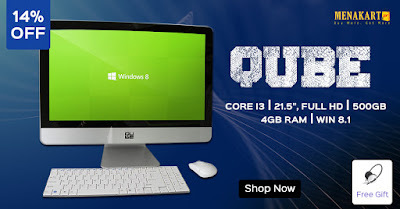 Enjoy the new style of technology with Qube All-in-One Elegant 21.5" Full HD, 500GB, 4GB, Core i3 Win 8.1 Spray Paint Silver Desktop. Its Full HD Screen with 1920 x 1080 resolution will make your experience more exciting and colourful. Perform your business or office tasks faster or indulge in some HD movies or videos on this large screen.